Music is a funny thing. Oh sure, it can make you laugh at times (both really good and really bad music can inspire laughter), but here i mean funny in the sense of "odd, strange, or behaving in unexpected ways". For example -- i received this album from the label way back in the apartment-dwelling days of May. I listened to it, but my mind was occupied with the stress of buying a home. So i thought, "This band does decent pop" and left it at that. Months (and one irritating move) later, Great Northern came to Atlanta on tour. I dug the record out again, and on subsequent listens have grown rather fond of it. Sure, this album is pleasant pop with nice vocal harmonies, catchy melodies, and toe-tapping rhythms, all in 5 minute bursts. Classic pop, to be sure, but the songs are engaging beyond the surface level. Take Telling Lies, which has become one of my favorite tunes this year. It starts with some nice chugging guitar cords from male voice, band leader, and guitarist Solon Bixler (a name which, surprisingly, sounds made up). Soon female voice/pianist Rachel Stolte comes in, to be joined by her piano, along with bass, and drums. On the chorus, as Stolte and Bixler harmonize "It's like a perfect picture of ordinary life", the whole band tears into it. The guitars get crunchy, the drums go crazy, and Stolte tinkles her piano through it all. The sound is dense -- there are layers of instrumentation going on, and unlike a lot of so-called "pop music", the vocals are not thrust to the far front of the mix. Instead, they blend in with the overall flow of the sound, weaving in and out of the other instruments, letting each take a turn at lead. A masterful production job courtesy of one Matthias Schneeburger, and one heck of a catchy song. Later, on A Sun A Sound the production and Bixler's male lead combines to make a tune that sounds like it escaped from a Flaming Lips record. And Staring Into the Sun (lots of solar references on this record), features a driving beat and female lead reminds me a lot of the epic, early work of The Breeders. The Middle features Bixler singing through distortion over staccato beats in a manner reminiscent of Sgt. Peppers-era Beatles, or, more recently, XTC. What i am getting at here is that there is a mish-mash of pop influences on this record. 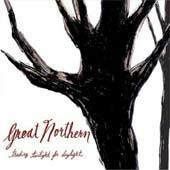 And yet, somehow Great Northern manage to tie it all together, and make it sound uniquely their own. Our British reviewers would describe this record as "a grower", and i think that's right. There are depths of intricate sound going on here, and appreciation grows on the listener slowly. Like a fungus i guess. At any rate, this is good stuff. Look out for this band -- this is only their debut record, so expect more good things to come.